Sen. Tom Cotton (R., Ark.) released a statement on Tuesday applauding President Donald Trump and his administration's roll back of an Obama administration climate rule. "This is a step forward for Arkansas and all of rural America. 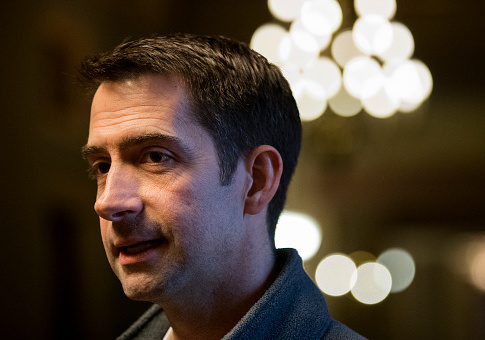 The Obama administration's plan would have amounted to a huge energy tax that would have raised power bills for Arkansans and dealt a blow to manufacturers," Cotton's statement reads. "The Trump administration's proposal, by contrast, will give our state's authorities the flexibility they need to make the right decisions for Arkansas. This new rule will go a long way toward rebuilding trust between the EPA and rural America, and I'm pleased to see it move forward." The Environmental Protection Agency (EPA) announced on Tuesday it would deregulate carbon emissions coming from coal power plants and allow states to set their own standards. This move is another rollback of the Obama administration's major environmental initiatives and could prevent future administrations from reimplementing the rule, CNN reports. The move would reverse Obama administration efforts to combat climate change and marks the fulfillment of a campaign promise at the heart of his appeal in coal-producing states like West Virginia — an appeal embodied by Trump's 2016 campaign stops in the coal country of West Virginia, Kentucky and Pennsylvania, where Trump supporters waved "Trump Digs Coal" signs and where the President-to-be donned a coal-mining helmet. The move is expected to spark an intense legal battle, with environmental groups already readying legal challenges to the new regulations. The Obama administration used a new reading of the Clean Air Act to implement the new and expansive rules. If Democrats or environmental groups sue the Trump administration, a court could rule in favor of the Trump administration and cement his approach to the law. "They’re trying to put in place approaches that would undermine in the long term EPA’s ability to do what many of us think is its responsibility under environmental laws to protect the public health," Janet McCabe, EPA air chief under Obama, said. Acting EPA chief Andrew Wheeler praised the decision. "Today’s proposal provides the states and regulated community the certainty they need to continue environmental progress while fulfilling President Trump’s goal of energy dominance," Wheeler said. Trump is scheduled Tuesday evening to visit West Virginia, the nation's second-largest coal-producing state. This entry was posted in Issues and tagged EPA, Obama Administration, Tom Cotton, Trump Administration. Bookmark the permalink.